America's 2014 FIREBALL RUN (September 26 to October 4, 2014) is a gripping and emotional 8 day, 2,000 mile, life-sized trivia game, where America serves as the game board and 40 driving teams compete for glory, bragging rights, and a plastic road sign. The mission of the race is a massive nationwide effort to recover America's missing children. The race is streamed live to a world-audience and begins in Frisco, Texas and ends in Independence Missouri. Enid, Oklahoma is one of just 8 city destinations during the race, serving as Chapter 4 in the FIREBALL RUN. All forty race teams and a nationwide audience will be in Enid, Oklahoma on Tuesday, September 30, 2014. Enid, Oklahoma also has a team in the race. 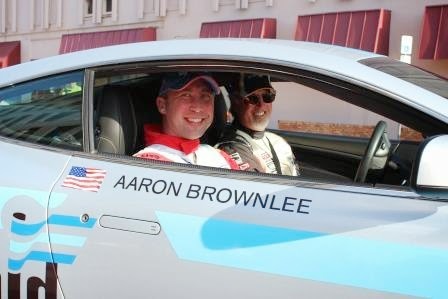 Dr. David Vanhooser and Aaron Brownlee will be driving a 2009 Aston Martin in the race, representing the city of Enid. Team Enid needs your help! The race revolves around the teams being given clues from a list of 2,500 TRIVIA questions regarding America's frontier. The team that solves the trivia questions the quickest has a distinct advantage in getting to the finish line first. No car can exceed the speed limit (monitored by the race and penalties for exceeding the speed limit), so the only true advantage is solving the trivia questions faster than the other teams. I am leading the TEAM ENID'S TRIVIA TEAM, and I need your help. If you would be available to receive private Facebook Messages from Team Enid's Website from Sunday afternoon, September 28 through the end of the race on Friday, October 3, 2014 and help solve the trivia questions given to the racers, then I need you to sign up to be a part of Enid's Trivia Team. The messages will be PRIVATE to keep other teams from taking advantage of our collective brain power. During the race, you will receive Trivia Questions and we simply ask that you respond on TEAM ENID'S PRIVATE FACEBOOK PAGE with appropriate answers! It's that simple. If there are multiple good answers, it will ultimately be my responsibility to determine the BEST answer - and send our racers on their way! Come on Facebook peeps! I have friends all over the nation (and you have friends too) who are excellent at trivia! Let's lead TEAM ENID TO VICTORY and win the national 2014 FIREBALL RUN! And possibly help find a missing child!